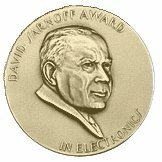 The IEEE David Sarnoff Award was established in 1959 through agreement between the RCA Corporation and the American Institute of Electrical Engineers, and continued by the Board of Directors of the IEEE. In 1989, sponsorship of the award was assumed by the Sarnoff Corporation. The award was discontinued in 2016.